Hiking Ucluelet's Wild Pacific Trail is a must-do for anyone visiting the Tofino-Ucluelet region of Vancouver Island. On this particular trip, a sharp-eyed local drew our attention to this eagle keeping a vigilant watch over the pedestrians below. Bald eagles aren't born "bald". They are actually brown all over and it's not until they are four or five that their head feathers morph into the distinctive white colour associated with them. This particular guy/gal still has vestiges of brown around its eyes. 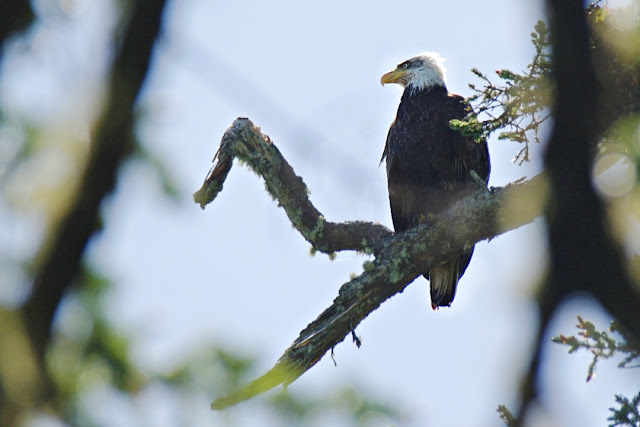 While in downtown Tofino one day we watched a monster of a bald eagle flying overhead. I guessed that its wings spanned six feet or more.